Photo: Professional Irish Dance Troupe, “Strictly Irish” will perform Saturday at 1p. Every Year since 1994, the Colorado Irish Festival has been showing folks how to have fun the Irish way! Be Irish July 8-10 at Clement Park, in Littleton! Entertainers scheduled to provide the musical backdrop this year include: Barleyjuice, making their Fest debut, will bring their highly contagious care-free Irish Rock. Their music has been chosen for TV and film (The Office, King of the Hill, Driven) and has been consistently ranked as “Best” by Irish newspapers; Also making their first appearance is RUNA. Contemporary yet leaning on the side of tradition, the band features Shannon Lambert-Ryan on vocals and monster acoustic guitarist Fionán de Barra (from Ireland’s musically renowned De Barra clan); Whether their shirts stay on or off, Albannach will call to your primal Celtic passions with pulsating tribal drums and bagpipes; McPeake, born from the legendary musical family and school from Belfast, will continue the family’s 100 year legacy of excellence with their third consecutive visit to Colorado; Also returning are Seven Nations and Enter the Haggis, two high energy bands with a history of rocking the house – 7N was described by one critic as “Explosive Seven Nations blows Palace into orbit … you’d be hard pressed to find a more original, unique but accessible group … powerful self-penned tunes and transcendent live shows. A musical force to be reckoned with, Seven Nations’ day has come.” ETH has been landing Billboard and iTunes World Music charting as well as major television appearances on shows like Live With Regis And Kelly, A&E Breakfast With the Arts and PBS’ popular program Out of Ireland, with its multi-influence style of Celtic rock. Colorado native and fiddler Michelle MacGregor will return to her old stomping grounds with her new band Hounds of Finn from St. Paul; Some of Colorado’s best bands who will be at the Fest, include Colcannon, The Indulgers, Potcheen, Mythica, Gob’s O’Phun, Skean Dubh, Mondragon, Juice O The Barley, and Lougheed. There’s loads more happening with Irish dance competitions and Irish dance performance by Colorado’s only professional Irish dance troupe Strictly Irish. Strictly Irish is comprised of four Riverdance and Lord of the Dance former Principal dancers, six World Champions, two 2010 World Championship medal holder, two 2010 Western Regional Champions. They have been seen on PBS and on tour with Celtic Fire. Current members: Shaun Casey, Aisling Toal-Casey, Martin Percival, Louise Connolly, Marcia Speights, Jessica Lesser, Eimear Toal, Hannah Hofreiter, Kate Shinnick, Blaine Donovan, Levi Hachi with a special guest performance from the 2011 World Champion Team “The Girls of Belfast.” Dueling Bagpipes will compete for awards and bragging rights; The Cultural Village will offer storytelling, music, history, and Irish genealogical workshops for adults and kids. Don’t miss the Denver Gaels as they battle it out in Irish Sports with teams from around the country. And of course spend some time to shop the Celtic artisans and other vendors, and enjoy plenty of food and drink Come and be Irish this weekend! www.ColoradoIrishFestival.com The Colorado Irish Festival is presented by The Colorado United Irish Societies (CUIS), a qualified non-profit organization incorporated in 1995 as a 501(c)(3). 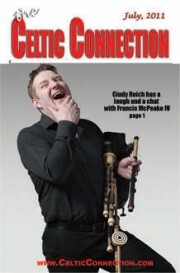 Cindy Reich talks with Francis about over 100 unbroken years of uilleann piping in their family, the latest status of their McPeake Music School and teaching John Lennon to play the uilleann pipes. The McPeake band will at the Colorado Irish Festival, Clement Park, Littleton CO July 8th and 10th. CR–Your name needs no introduction in the world of Irish Music, but there may be people in the U.S. who are not as familiar with the lineage and the history of your family. You’re the fourth in a series of McPeakes who play the uilleann pipes. FM It all started with my great-grandfather, who was born in 1885. He was called Francis McPeake and since then, every first son has been called Francis. For some unknown reason he developed a love for the Irish bagpipes, also known as the uilleann pipes and also developed a love of Irish traditional music. So it has been going on now for over 100 years. CR Now, your great-grandfather learned the pipes from blind John O’Reilly who was from Galway, is that correct? FM That is absolutely correct! Now there is not a lot of people who know that! If we look at Irish music today, it is a global world music, but at that time, around 1904-1905, Irish music was literally dying. So to find a piper, my great-grandfather had to find one all the way down in Galway. At that time it would have taken 8-10 hours for him to get from Belfast to Galway. So the blind piper had to go on the train from Galway to Dublin, then from Dublin to Belfast. He actually lived with my great-grandfather for six months because that’s how long it took to learn the foundation of learning the pipes—but also to make that long journey worthwhile. CR The uilleann pipes would have been quite rare in Belfast at the turn of the century, would it not? FM Most certainly. What happened was, a historian based at Queens University was a good friend of my great-grandfather’s. He was very involved in keeping the music and language alive. His name was Francis Joseph Baker and he heard that my great-grandfather wanted to play the pipes so he went on a mission—find out who made pipes and where to get them. There is a funny story in that. There were two sets of uilleann pipes and two harps that were put on a boat with a couple of Irish guys to go to the St. Louis World’s Fair. Well, when the instruments arrived in America, lets just say that the Irish guys were a wee bit worse for wear—from too much Guinness. The Irish guys got off the boat, but the instruments stayed on the boat and the instruments ended up back in Ireland. And from that misfortune of events, my great-grandfather got a set of pipes. And its very, very strange, but about 40 years later, they actually got one of the harps as well. That’s how rare uilleann pipes were at that moment in time. We still have that set of pipes at the house. But we also have a set of pipes by a Glasgow maker. Even now, the pipes I play at the moment—the drones and regulator are made by a Cork maker, and my chanter is made by a guy in Vermont! So you find great makers all over the world now. CR—Every pipe player that has played in Colorado has cursed our altitude and climate. Have you played the pipes in Colorado before? FM—I’ve been fortunate to be asked to play in Colorado twice before at the Irish Festival, but I’ve been unfortunate enough to be a piper at the Colorado Irish Festival (laughing). It is without a doubt one of the worst places on the face of the earth to play the pipes. Because of the cane that is in the chanter reed. It is very susceptible to altitude and destroys very easily in the climate of Colorado. You could very easily play the pipes in Colorado and by the time the gig is finished, the reeds are destroyed. CR—Well, I’ve heard of pipers trying reeds that were made here in Colorado when they play the pipes here so that they are acclimatized. Does that work? FM—Well, its not that they have to be physically made in Colorado. For example if I got reeds from my maker in Vermont, I would have to send them to Colorado and have them taken out and get accustomed to the Colorado climate for a couple of weeks, they would probably be playable, I’d say. Even my own reeds—my father is making mine at the moment, it would take a couple of weeks to get them used to the Colorado weather. So lets just say that when I get on the plane from New York for Colorado, the grey hair will already be starting to appear on my head!! CR—We’ll forgive you any odd sounds when you arrive, then! FM—Any squeaks or squawks that you hear? Thank you very much! CR—We’re just glad that having played the pipes in Colorado, you are willing to come back and do it again!!! Now the McPeake family has been responsible for teaching hundreds of students over the decades and like all other arts organizations is having trouble staying open. Tell us what the status is at this time of the McPeake School Of Music? FM—Basically, as you said yourself, it’s on extremely hard times at the moment. We’re at the point of maybe having to close. We’ve been going since 1977, so for over 30 years. We’ve been unable to maintain the facility we’ve been in for the last 7 or 8 years, because as soon as the recession hit, the first thing to lose funding was the arts. It was the first thing to happen in Belfast, and has happened to the arts all across Ireland. But what you are faced with, when people are feeling like this, what people need the most now—is the arts. We’re always looking for funding. We’re always looking for money. We’re always trying to keep the heart of Irish traditional music alive in Belfast. CR—If people want to learn more about the McPeake School of Music, is there a website up? FM—There is a website—www.francismcpeake.com but it is getting totally refurbished and should be up around the end of July. It will be a multi-media site with a lot of great things up on it soon! CR—With all the legendary history to your family and all the pipers, do you have most of the pipes that have been played in your family? For example, do you still have your great-grandfather’s set of pipes?? Who made some of the pipes in your family? Are there any pipe makers within your own family? FM—No, no pipe makers. My father made my bellows and my reeds. There’s a fellow in Scotland called Craig Ballantyne—he makes my bag, the drones and regulators are made by Alphonsus Kennedy in Cork and my chanters are made by Benedict Koheler in Vermont. But what I can say is yes; we still have all those sets of pipes. My father is playing his set, which was made by Kennedy of Cork, also. Those pipes were actually made for John Lennon. When my father was teaching John Lennon to play the pipes with the Beatles and John no longer wanted them, he let my father keep them. Equally, at the same time, we have my great-grandfather’s set which was made by R.L.O. Mealy at the turn of the century in the key of C. My father and I play in the key of D. So we have a whole range of pipes. We even have a set of pipes made by the legendary piper Leo Rowsome. CR—Well of course, this now begs the question—if your father was teaching John Lennon how to play the uilleann pipes—did John really learn how to play, or did he just dabble with it? FM—Believe it or not, I was with my father just a few nights before I left for this tour and we were watching a documentary on John Lennon. And I asked him, “What was John Lennon like as a student?” And it was just the two of us in the living room and he wasn’t going to tell any fibs—as they say.. And he turned around to me and said, “Son, I can honestly say, he was the best student I ever had”. He came to terms and grasped the concepts of the pipes-how to play, and what was needed to become a piper quicker than any other student he ever had. So there you go. CR—That is absolutely amazing. Because a lot of people like the idea of the pipes, but when they find out what it really takes, they bail out pretty quickly. FM—Equally, at the same time, the McPeake family were not only known as pipers but as singers. My great-grandfather, grandfather and father were able to sing and play the pipes at the same time. Unfortunately the gene has not been passed down to me–yet. CR—And that had never been done before—singing and piping at the same time, until your great-grandfather did it. FM—No, never. So if we bring ourselves back to the beginning of this interview and blind John O Reilly—after they parted ways in 1904– in 1912, my great-grandfather entered the World Championships of piping, called the Oireachtas, in the Junior section. But he did not know that his old tutor, John O’Reilly was in the senior section. John came into the room where my father was piping for his competition. Neither one knew the other was there, and after my great-grandfather finished playing his first set of music, John O’Reilly stood up and said, “Francie—sing them a song—sing them a song!” Because he was the only person John O’Reilly had ever come across who could sing and play pipes at the same time.